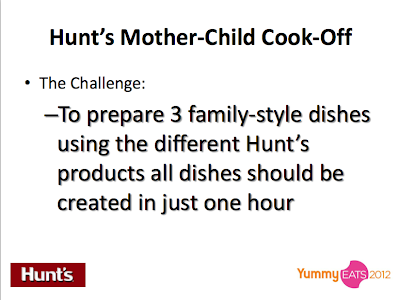 I did not realize what I have gotten myself into when I said 'yes' to Yummy Eats' invitation to participate at the 'Hunt's Mother-Child Cook-Off'. Only a few days left to the foodie fair and I am still unsure of how I'm going to pull this off! Many thanks to the Yummy team and Hunt's for choosing me to be a part of this big event. It's such an honor. 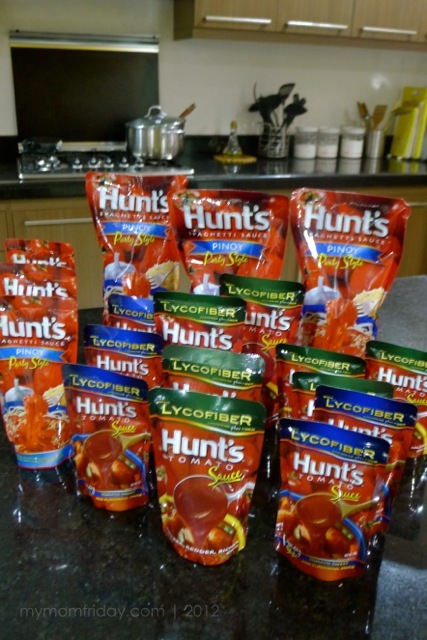 I've been using Hunt's pasta and tomato sauces for the longest time so I really welcomed their invitation to participate. There will be 3 of us -- my mom blogger friends whom I am up against are Jackie, and Pehpot. 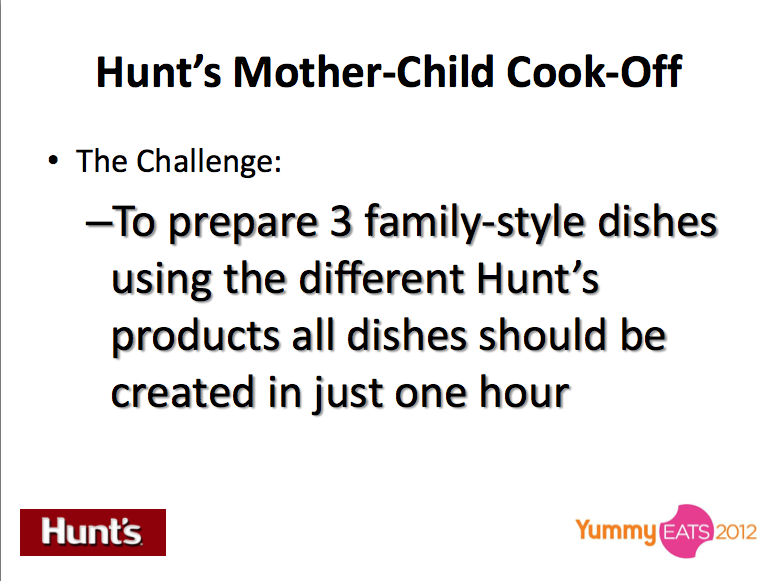 We will be in tandem with our kids, so that's another challenge altogether! I am thrilled, nervous, pressured, excited, all at the same time! Last night, I tried to experiment on the dishes I am planning to present on Saturday. Let's just say I needed to make some changes on my game plan pronto! Now, I doubt if I can do this in 1 hour! Thanks to Hunt's for the product samples! Come to the fair and find out if I make it out alive! LOL!!! 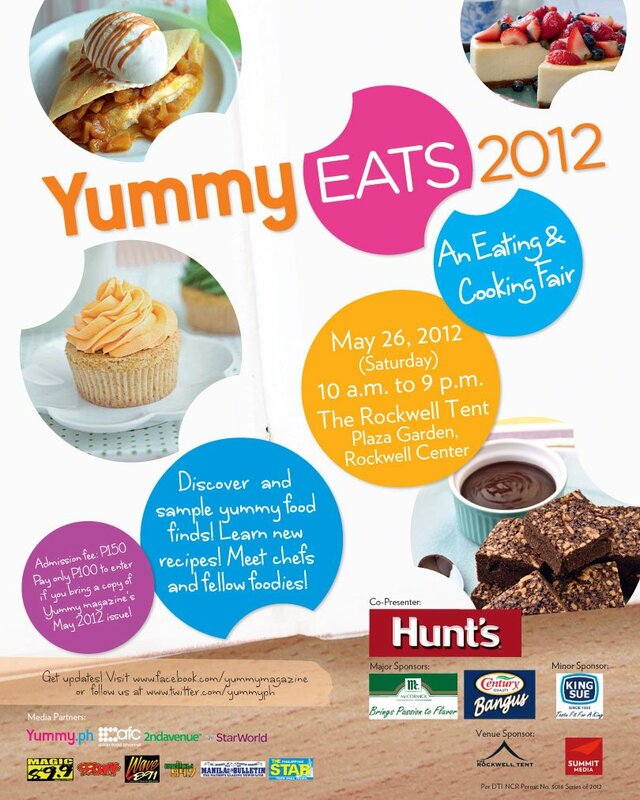 I am inviting all of you to come and support me and my fellow mom bloggers at Yummy Eats. We will be on stage at 2 pm. I'm really nervous and stressed just thinking about this, but I know it's going to be an exciting one-of-kind experience for me and my boy. Wish us (loads of) luck!!! Learn more about Yummy Eats 2012 here, and get updates or win free tickest from Hunt's on Facebook. 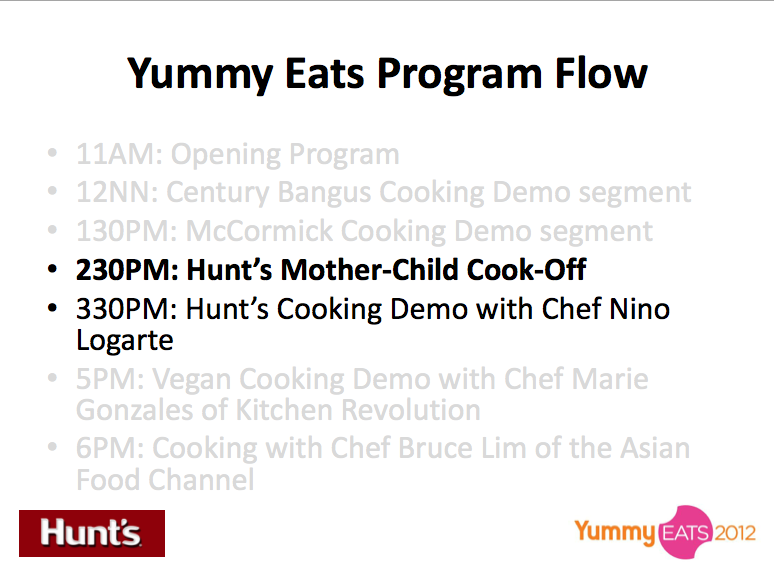 Here's what happened at the Yummy Eats-Hunt's event - check out my dishes at the Cook-Off .